Stephen Wadsworth's production featured detailed naturalism in select objects and architectural features, and a Personenregie which, while emotionally realistic, used a lot of stylized gesture reminiscent of dance (inspiration from a Euripidean chorus, perhaps?) Pictures from the 2007 run, with the same three principals, may be found here, with the caveat that much of the production's interest comes from its use of space and movement, neither of which shows to good effect in still photographs. The stage is divided into two unequal parts, with the greater the Temple of Diana, the smaller the prison where Pylade and Oreste are confined. (When Pylade and Oreste are chained to the temple altar, the priestesses move to the adjacent room, reinforcing the consciousness that Iphigenie, too, is a prisoner.) The affair opens with a display of ballet and stagecraft that would have delighted the eighteenth century: Iphigénie is sacrificed in pantomime over Clytemnestre's protests, whereupon Diane descends from the heavens, revives the girl, and whisks her up into the rafters. Iphigénie wakes from a nightmare and the orchestra begins. Dancers mingled with the chorus throughout, and even the movements of the singers were extraordinarily balletic. Occasionally I thought this threatened to become too much of a good thing, but the symmetry between Oreste and Iphigenie, exhausted and traumatized on opposite sides of their wall, was a nice touch, as was the symmetry/tension between Pylade and Oreste. The stylized choreography of the Scythians also made very clear the sexual threat to the women from their captors. Wadsworth's coup de foudre, though, comes at the close. More on that anon. Patrick Summers led a taut, strongly-propelled account of the score. There were a few moments where synchronization with the chorus seemed slightly off, but they were few, and quickly corrected. The melancholy lyricism which I've mentally associated with the score was there, but also eruptions of wildness both apt and exciting. Lei Xu, in her Met debut, was a standout as the First Priestess, with a supple and lovely soprano and assured, eloquent stage presence. Second Priestess Cecilia Hall (another debutante) was also very fine. I hope that Gordon Hawkins, who sang Thoas, was having an off night. I was intrigued by his leathery baritone, but he sounded as though he were pushing without reserves. Granted, dramatic subtlety may not be what one associates with Thoas, but some ominously emphasized phrasing would be nice. Paul Groves sang a beautiful Pylade. His bright tenor rang out impressively, but he also used it with considerable subtlety when called for. His anguish came across as both credible and creditable, and his love for Oreste as both genuine and, perhaps, romantically thwarted. Oreste was sung in Gluck's tenor rewrite of the part by Plácido Domingo. Maybe you've heard of him. Yes, Domingo's instrument is worn, but still heroic. "Dieux! qui me poursuivez" was a little bit anxious; I missed bits of diction, and he wasn't coming over the orchestra as clearly as elsewhere. The performance as a whole was so finely done that it seemed raw. Domingo embodied a man pursued by furies, an honorable man who has committed a crime that haunts him, and who is being punished for it in ways that strain the edges of his sanity. Every line of his body is weary. When he and Susan Graham meet eyes for the first time, you can see them both aching with the desire for hope. The moment when Oreste ascended the steps to the sacrificial altar was a dramatic set piece made to be filled by a presence such as Domingo's; the expression on his face was indescribable. (Yes, I cried.) His complex timbre contrasted beautifully with Groves', and the older/younger man dynamic worked well for their respective roles, I thought. And the beauty and drama were multiplied when all the principals came together. I've heard Susan Graham live before, but her Iphigénie was revelatory. Graham sang and acted this anguished woman with an entirely unexpected intensity. The production established both her deep trauma, and her courage and generosity of spirit as the nurturing leader of the priestesses, from the outset. She was radiant of voice, shaping phrases fluidly, and everything counted. From her haunted narration of her dream, to her proud interactions with Thoas, to her feverish intercessions for and with Pylade and Oreste, she made me believe. And then there was the ending. Clytemnestre, in this production, is portrayed by a spectral dancer, connected with both her children by various gestures. And although Iphigenie has forgiven Oreste for his nameless crimes (I got choked up there, too,) when Diane names the murder of Clytemnestre in pardoning Oreste... Iphigénie freezes. I would have sworn I saw Graham's eyes glaze over. She snaps out of her trance when one of the revelers waves in her face a scarf made of the fabric of Clytemnestre's gown. And she grabs it, but her attempts to make others share her outrage are vain. She is keening, broken, and more alone in her anguish than at the outset of the opera. Oreste repeatedly tries to approach her, but she can't stand his touch. Gradually the celebrations fade away, leaving dancers visible in a lighted door. Pylade leans against the frame, and watches the siblings left alone on stage. Oreste opens his arms to his sister, and she flies at him and starts wildly throwing punches at his chest, sobbing between her teeth. He doesn't defend himself. It is at the last possible moment that she accepts his embrace, and clings to him, convulsively, as he to her. Not the happy ending I was expecting, but something more facile might have seemed insulting to the emotional honesty of the performers. Thank you very much for the enlightening review! Interesting that the 1781 version should have been used, in which, as you say, Gluck revised the part of Orestes for tenor; I had assumed (wrongly) that Domingo would simply have been singing another baritone role. By the sound of it, though, the opera was sung in French rather than German, so I wonder whether the performance used a mixture of Paris (1779) and Vienna (1781). i cried when i was watching DOmingo´s Simon Boccanegra. 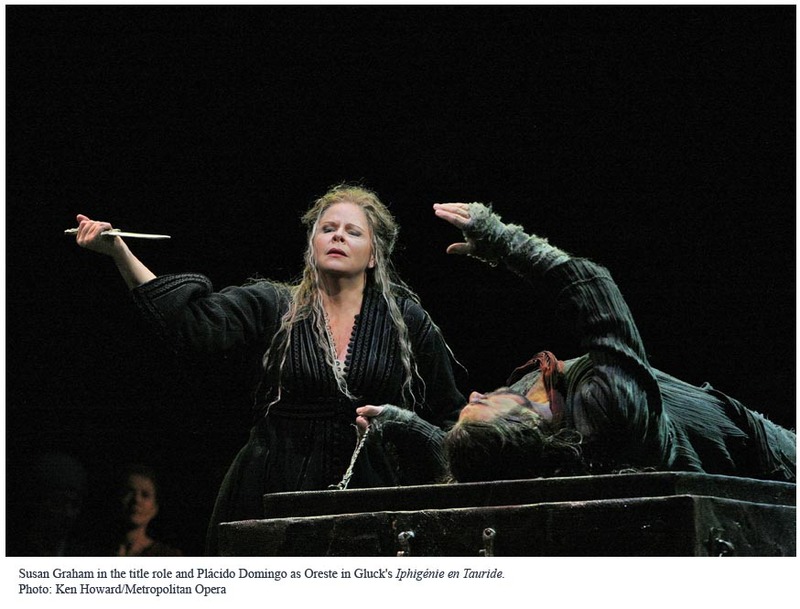 This performance seems great, it is credible that Iphigenie is angry that her mother was killed by Oreste,but she forgives because he is her only family member left. i am looking forward to seeing it in the cinema. have you already seen Nixon in China? @Mark Berry Thank you so much! I too had presumed that Domingo would sing Oreste as a baritone, but no. According to the program note, this version used the Vienna revisions to the parts of Oreste and Thoas, but it was sung in French. Is either Strauss or Gluck due for an anniversary which could serve as an excuse for the 1889 version? I didn't know such a thing existed, but my curiosity is piqued! @asperias That level of emotional immediacy is one of the things which makes Domingo very special, I think. The ending was indeed powerful, and Graham was astonishing. I suspect that conducting could elevate it still further, but it should still be quite the experience I'm glad they've chosen to put it on the HD roster. I haven't seen Nixon yet, but I do plan to. I actually get to see it now: Luxembourg gets the Met broadcasts in its big movie theatre. I shrieked very loudly when I saw it advertised. So excited! @Christie Excellent! Happy news indeed!